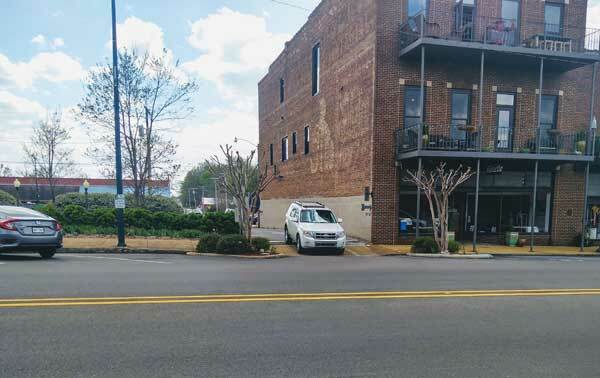 Home » News » Local News » City Board considering closing the alley from Main St. to Bankhead St.
A surprise City Board agenda item aims to close the alley to traffic between Main St. and Bankhead St. The New Albany Board of Aldermen may close an alley that provides one of only two routes downtown that connect the town’s two main streets. Although there had been no discussion of it in the board’s recent public meetings, an item appeared on the April 3, 2018, agenda that would close a one-lane, one-way alley that connects Main Street and Bankhead Street. About 210 feet long, the alley runs northeasterly from Main Street, between the Hamilton Building and Cooper Park, delivering automobile traffic to Bankhead Street. NAnewsweb.com observed traffic on the Main-Street-to-Bankhead-Street alley Monday afternoon, May 9, from 4:55 p.m. until 5:10 pm. During that 15 minute period, 22 vehicles transited Main to Bankhead, each slowing carefully to turn right onto Bankhead. The Board is believed to have discussed the alley closing during its regular, secret “Executive Session,” but took no action. Between the Tallahatchie River Bridge and Camp Street on the east side of the Union County Courthouse, a distance of 3/10ths of a mile (1,540 feet), there are no two-way streets that connect Bankhead Street and Main Streets. Only two connector streets in the old downtown area allow transit between the town’s two principal streets. Besides the alley targeted for closing, there is another one-lane alley 125 feet to the east, moving traffic from Bankhead to Main. Carter Avenue, the main route from Interstate 22 to downtown New Albany, empties directly in the alley which is proposed to be closed. Hundreds of motor vehicles each day use the alley to go from Main to Bankhead. There is a somewhat “blind” intersection where the Main-to-Bankhead alley crosses a pedestrian sidewalk on Bankhead Street. A large convex mirror gives motorists and pedestrians an improved view and “speed bumps” slow traffic coming through the alley. A sign directs that only right turns are to be made onto Bankhead Street. However, it is known that some drivers disobey directions and turn left (west) onto Bankhead, crossing the eastbound lane of Bankhead (and usually a row of vehicles parked illegally in the middle of the street). At least two elected city officials said they did not know the proposal to close the alley would be on the agenda and were surprised by it. “Nobody has talked with me about it,” said New Albany Chief of Police Chris Robertson. “I have not been in any recent discussions about it. I do not know where the push came from to close it.” Robertson, who has been a lawman in Union County and New Albany for over 20 years and has been police chief for five years, said he did not know of any serious injuries that had occurred where the one-way alley exits onto Bankhead Street. Fourth Ward Alderman Will Tucker, a veteran alderman, told NAnewsweb.com, “It surprised me in the board meeting when it came up on the agenda.” He said he is not in favor of closing the alley. “If you will remember,” said Tucker, “we [closed the alley] on a trial basis a few years ago. It did not go well and it re-opened. We then installed a speed table. It is supposed to be a right turn only when exiting the alley, and, when used in that way, it helps with traffic flow. “I have received numerous complaints about closing of the alley, but not a single complaint about it being open. I think there are concerns about public safety which are always top priority, but I represent the citizens of the city and feel the majority of those who voiced their opinion want it to be open,” Alderman Tucker concluded. It is not known when or whether the question of closing the alley may come before the New Albany Board of Aldermen again. Persons wishing to express their opinions on the matter may comment on this article, post their opinion on social media or contact their aldermen or New Albany City Hall. 1 Comment on City Board considering closing the alley from Main St. to Bankhead St.
Have you ever noticed that when a body of government meets it is usually to take something away from the people? This is typical though. Instead of punishing those that misuse something they penalize the law-abiding.